The Panasonic 35-100mm f2.8 II Lumix G X Vario Power O.I.S. 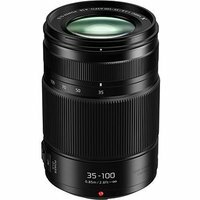 Lens for Micro Four Thirds interchangeable lens cameras delivers a versatile focal range (70-200mm on a 35mm camera) in a compact, easily portable design. The lens is an update to the original model and now offers support for Power O.I.S (Optical Image Stabiliser) and 5-axis Dual I.S. (Image Stabiliser) when used with the latest Lumix G cameras, such as the GH5 and G80.